Q: Could you tell us your story and something more about ST Robotics? A: ST came out of my work with educational robots back in the 80s in the UK. I was regularly asked if that robot could be used in this or that professional application, for example laboratory work. It wasn’t designed for such uses so I set about designing a bench-top system with the help of a mechanical engineer. In the 90s I teamed up with Mathew Monforte in New Jersey and started the US corporation. We then started marketing robots around the world. We had four basic models: R12 500mm arm, R17 750mm arm, R16 cylindrical format arm and the R15 custom built Cartesian system. In 2002 the R16 was replaced with the R19 and in 2009 the R12 was redesigned keeping the same reach and model number. A: ST aims to provide boxed robots that can be unpacked, set up and programmed by anyone with or without programming experience of any kind. In fact we aim to make the robots so easy to program that people can learn robotics without huge investment in money or time. Above all they need to be affordable so we want to bring robots to people who might otherwise not see a pay-back. 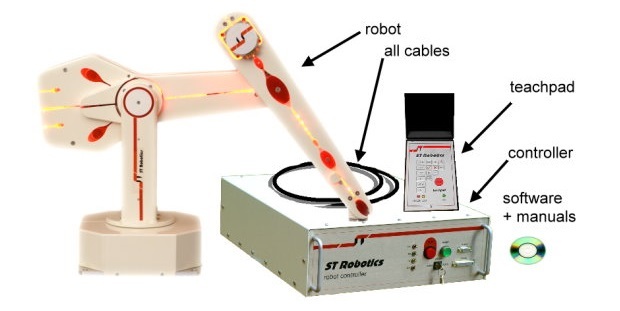 Q: What are main features of your r12 collaborative robot arm? A: When we redesigned the R12 back in 2009 my instructions to the designer were to result in a robot with similar kinetics to the original R12 but designed like a sports car – fast and accurate – but using the same basic technology. Payload was less important because most user’s products don’t weigh much. 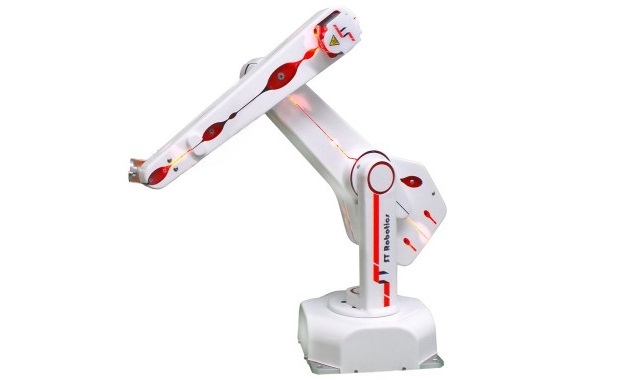 It was designed as a 5-axis robot since only 20% of users actually need 6 axes and the 20% extra cost was not justified. So the 6-axis version is acheived with an optional bolt-on module. Additionally (and importantly) the designer had a eye for aesthetics and as a result it has great looks as well as performance. Q: What are main advantages of your Robot software? A: This is called RoboForth. The main advantage is it’s so easy to use. Almost all robot manufacturers say that but RoboForth is command driven. Everything is done with English language words. Literally within a few minutes a user can type a sequence of words or commands to the robot and see it move. A: The robot market is vast and growing fast. ST has a very small market share. Our products are mature, reliable and good value. At this time we have over 30 accessories from grippers to tool changers and we do not need much more product development. It is now time for us to seriously market the products. We are already building a distributor and more importantly an integrator base and will build that up over the next 6 months. We are also on the lookout for VC which would seriously speed up that process.